Beyond the doorway was a room full of wolves, but all facing the other way. Tam, Nina and Chiz dived in behind the curtains. Then, hidden by the folds, they slipped forward through the arch and peeped out on the other side. ‘Must be the royal throne-room,’ muttered Nina. It was a huge oval space, with high officials and senior officers on all sides. The walls were hung with flags as big as bedsheets, red and black, emblazoned with G and I for Grince the First. 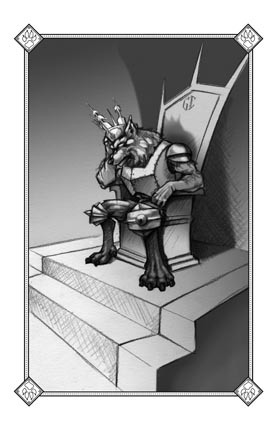 In the centre was a massive silver throne built up on four massive silver paws. Grince the First didn’t look especially big or especially old or especially authoritative. He looked like an ordinary grey wolf wrapped up in a red and black robe. On his head was a crown of white metal, with a circlet of spikes and embedded green jewels. Yes. Very, very magical. Berkiss sounded puzzled. Something wrong with her, though. She’s been tied on. It was true: thin wires wound round the top of the crown and under the wolf’s jaws. Grince had fixed the crown so that it couldn’t be removed from his head. Now they noticed the red carpet leading up to the throne from a second doorway. Outside the doorway was a queue of wolves carrying baskets, a queue that stretched back out of sight. On Grince’s order, the two wolves at the front lowered their basket and lifted out a pair of cubs. ‘Hurry it up,’ growled Grince. The wolves advanced along the carpet and deposited the cubs at the foot of the throne. The cubs crouched on all fours, whimpering. One tried to sidle off, but its bearer brought it back into position. As both wolves stepped back, Grince leaned forward and gripped the skulls of the cubs in his paws.